This circuit is based on a design by Dave Pick G3YXM and has been redesigned using SMD coils after the original parts were made obsolete. Two versions have been designed, one for 136kHz and another for 472kHz which uses the same PCB. The boards are supplied built and aligned for mid band. 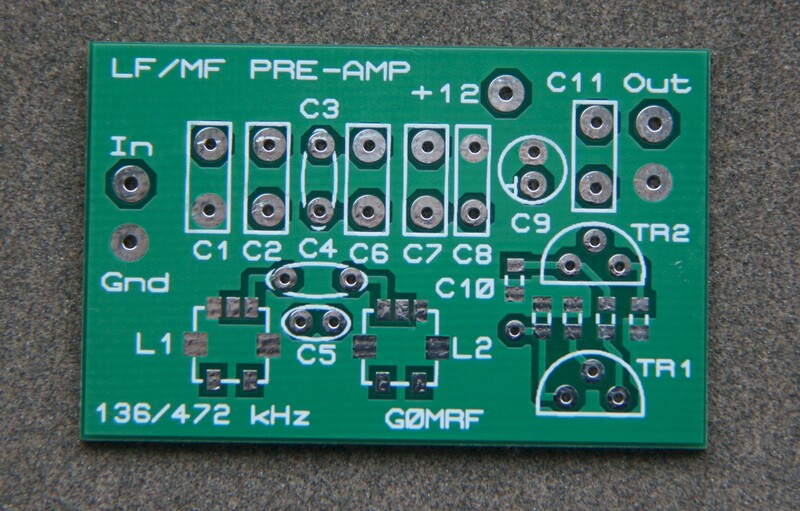 Blank PCBs (48 x 31mm) are also available should you want to construct a version for another area of the LF / MF spectrum. - See kits page for details. Most commercial amateur receivers have a relatively poor performance when tuned directly to the 136kHz LF band. It is common for receivers to have an attenuator permanently in circuit below 1.8MHz to prevent overload from high powered broadcast stations. Unfortunately this and a general 'lack of performance' below 500kHz severely reduces the ability of the receiver to pick up weak amateur transmissions. However, a pre-amp will overcome these losses and restore your radio's sensitivity. The pre-amp consists of a top coupled bandpass filter using a pair of Toko coils followed by a FET amplifier and a bipolar transistor buffer. 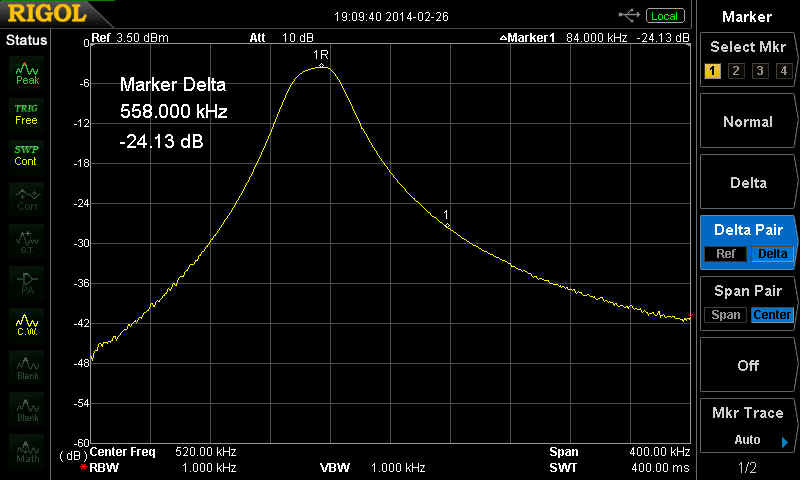 The overall gain is apx 11dB on the 136kHz version, and 14dB on the 472kHz version. This is enough to overcome the losses of most commercial receivers. The bandpass filter has a narrow response which prevents the preamp being overloaded by broadcast and other high powered transmitters operating in the LF / MF spectrum. The capacitors used are 5% polypropylene and ceramics. If you have an application on another on a different frequency, then the blank board has space for 2 capacitors in parallel for each coil allowing any frequency 100kHz to 1.8MHz to be covered using standard values. The coils are adjustable over +/- 6% of their nominal value. Input / Output impedances are suitable for 50 / 75 Ohm systems. 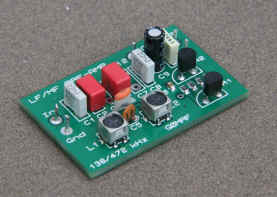 136kHz receive pre-amplifier. Blank PCB also available. Marker 1 @ 100kHz. Marker 2 @ 198kHz. Power required is a nominal 12V - 13.8V at 20mA. Output 1dB compression point is apx. +4dBm.